In Keeping with what I said the other day about trying to update this more often again I thought I’d start by Reviewing one of the albums I’ve been meaning to do for the last 4 months!! 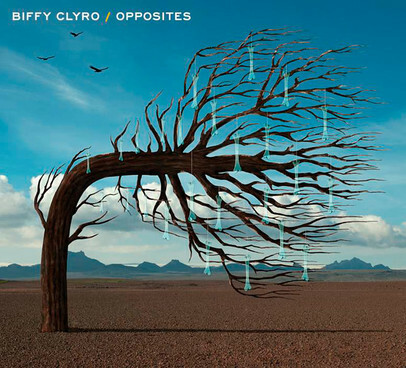 Biffy Clyro’s latest offering ‘Opposites’. Lets start by stating the obvious it’s no real secret that I’m a HUGE fan of this band and that in all honesty that probably will cloud my judgement slightly with that being said however I still think that ‘Opposites’ is a REALLY good album especially considering it’s a double album. ‘Different People’ starts the album with some synth slowly getting louder before Simon Neil cuts in with his guitar and vocals for a continuation of the mellow build up before it hits into a riff that everytime I hear reminds me of ‘The Pretender’ by the Foo Fighters, the guitar tone is fantastic and you can tell from this early point just how polished this album is going to sound a really strong way to start the album! Up next is one of the lead singles from the album ‘Black Chandelier’ which is an obvious choice for a single very radio friendly big epic arena sized chorus, but the star of the show in this song for me is the little beatdown bit. ‘Sounds Like Balloons’ comes next and is the first song to capture that quirky Biffy Clyro guitar style, it then proceeds to merge that with arguably the hugest sing-along chorus on the whole album, you also get the first taste of the funnier side of Biffy Clyro’s lyrics ‘Ancient Rome, we built that fucker stone by stone’. Next to appear is the mellow semi acoustic number ‘Opposite’ which takes the place filled by ‘God & Satan’ on ‘Only Revolutions’ or ‘Machines’ on ‘Puzzle’, a perfectly nice little song but definitely treading on areas they have before. The first song I heard from this album was ‘The Jokes On Us’ when it was debuted when Biffy supported the Foo Fighters at Milton Keynes, as soon as I heard it then I liked it and I remember listening to the grainy sounding crowd shot versions of the song for quite a while afterwards.. it sounds really great on record really crisp and precise. Another single ‘Biblical’ comes now before another three songs give way to CD1 closer ‘The Thaw’ which is another of the more mellow beautiful Biffy Clyro songs and is a really nice way to conclude the first half of the album. Disc 2 starts with the first song that was officially released from the album ‘Stingin’ Belle’ which is very to the ‘Opposites’ album what ‘That Golden Rule’ was to ‘Only Revolutions’, by which I mean that heavier sounding really meaty sounding song, I find that Biffy Clyro tend to when you see them live, with the first song, either give you an epic opener such as ‘Different People’ like on disc one, or a smash mouth straight at you opener, with this album they achieve both starting each disc with the opposite (no pun intended) ends of the spectrum, this song is concluded by the awesome addition of bagpipes!! ‘Modern Magic Formula’ follows and displays some of that quirkyness again as Simon ‘Freaks Out’ this was one of the 2 previously non played songs they cracked out when I saw them at Download. Next to appear on the album is a mariachi band for the song ‘Spanish Radio’ which is an interesting and different vibe, ‘Victory Over The Sun’ follows which is in all honesty probably my favourite song over the double album, it has such an old school vibe to it, so much so it would probably slot straight into the ‘Blackened Sky’ album relatively unnoticed, as it is a slow builder with lots of clean picking before eventually they slowly build up on the distortion a little bit at a time, I genuinely can’t put into words how much I love this song. The less said about ‘Pocket’ the better really it’s the one song No matter how many times I’ve tried I just can’t take to it’s just far too… poppy. ‘Trumpet or Tap’ sees the inclusion of a genuine tap dancer on the chorus and is another song that is a slow burner as it gently winds it’s way to an heavy conclusion. ‘Skylight’ is another massive high point in the album for me it’s such a beautiful song and it genuinely gave me goosebumps live. Finally another couple of decent songs give way to the final song ‘Picture A Knife Fight’ which is rockier number with yet another huge chorus clearly written for the huge arenas they now fill on tours a pretty solid way to finish a very strong album. Overall as I say I think there is probably some bias in this review but even when I push that aside (or at least attempt to) in my opinion you are still left with an extremely strong rock album, and what will in all honesty come the end of the year be in the mix for one of my albums of the year (Along with the next to be reviewed ‘The Next Day’ by David Bowie) in a time where guitar music is definitely on the decline in the mainstream at least Biffy Clyro are one of the few shining beacons left keeping the fight alive!